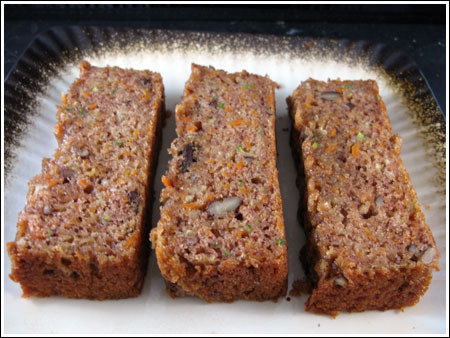 Garden Harvest Cake is an 8x4 inch quick bread that can be served as breakfast, snack or dessert. Preheat oven to 350°. Grease and flour an 8x4 inch loaf pan. In a mixing bowl, thoroughly stir together the flour, sugar, cinnamon, baking soda and salt. Add grated apple, grated carrot, shredded zucchini, and walnuts to flour mixture; toss well. Combine canola oil, buttermilk, and eggs in a small bowl, stirring with a whisk. Add egg mixture to flour mixture, stirring just until combined. Spoon batter into the loaf pan and bake at 350° for 50 minutes or until a wooden pick inserted in the center comes out clean. Cool 10 minutes in pan on a wire rack; remove cake from pan. Cool completely on wire rack before slicing.